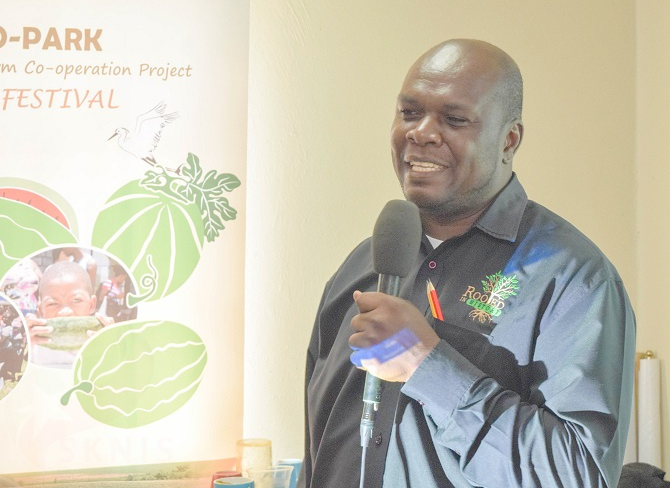 BASSETERRE, St. Kitts –- A training workshop aimed to further enhance the experience of potential visitors and patrons was presented Sept. 4 by the management and staff of the St. Kitts Eco-Park, also known as the Agro-Tourism Demonstration Farm Co-Op. At a brief opening ceremony to start the workshop, Farm Manager, Kenney Manning, said he anticipates the workshop will help to improve the skills of his staff and increase the marketability of the facility. He said the Eco-Park is poised to contribute greatly to the overall development of the nation, particularly in the areas of tourism, culture, agriculture and social values. “This workshop is intended to enhance our skills and hopefully give us the opportunity to give more of what the tourist wants from us and therefore increase our marketability and profitability,” Manning said. The workshop, facilitated by Leonard Stapleton, covered topics such as Heritage tour development, tour guide skills training and role-playing. He also gave the participants a comprehensive history of the island through plants so that they can understand and explain to visitors how some of the local plants on the island came into existence. “My main passion is educating people and most of my time these days is spent educating them about the rich history and heritage of St. Kitts and Nevis, so this is why I am pleased to come on-board with this exciting new project,” said Stapleton.